Yesterday, I came across a post that was about a Python package installation. I was commenting to see if they could give more info, when I noticed the user was using too much caps lock on their posts. I calmly warned them and then edited the question later. The user kept on using caps. I wanted to know if this post's comments should be flagged because I don't want to make any harsh moves. The post [deleted so only visible to 10k users; some comments deleted]. That's a very clear case of someone simply not knowing how to format their text properly (thinking that ALL CAPS is a suitable form of emphasis, rather than using italics), not someone trying to be rude or insulting to people. Feel free to fix it, along with the various other presentation errors with the post. If there's some evidence that the user is doing it to be disruptive, and that they are doing so intentionally, then there's some context that's missing. If that's the case, certainly don't flag the post as "rude" (the moderator wouldn't see such context and would likely decline the flag, because using caps isn't abusive), use a custom flag to explain why you feel the user is using improper formatting intentionally. Let's not feel like we're walking on egg shells here. Take a moment to calmly look at the post and see what's really being said. The user is using caps for emphasis, which isn't exactly desirable, but is definitely not rude. While all-caps translates to shouting, it doesn't seem to be the case that this is the OP's intent. I don't see much value in the way of us going in and trying to calm them down, either. Comments like that have a tendency to escalate and get out of control quickly, so I'd personally like to steer clear. Should the behavior persist yet not rise to the occasion of impoliteness or rudeness, a simple custom mod flag explaining what's going on and asking the mod to see if they can use a different way to show emphasis would be enough. This doesn't require a deep and analytical Meta post when this happens. If you don't know what to do, it's better to do nothing and let another person deal with it. No, wrong capitalization does not make a post rude any more than excessive bold font does. The question might have other problems though; I would consider voting to close. 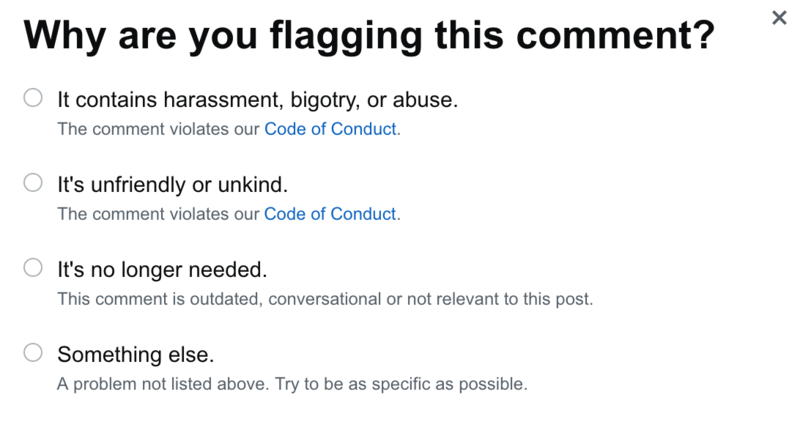 The user's behavior seems to be inappropriate, but I don't think flagging is the right first step response. The first step probably should be letting them know that ALL CAPS is considered shouting, which is inappropriate and unnecessary. The user's comments seem to suggest that they're genuinely frustrated with the circumstances, so letting them know that they're acting out could help them calm down. If they ignore your suggestion or otherwise continue to act inappropriately, I would say that the time has come to escalate things to the level of flagging. I wouldn't go so far as "Harassment, Bigotry, or Abuse", just "Unwelcoming/Unkind". Though a "something else" flag might help the moderator better understand the problem. Pretty much any flag would be valid, as the comments were so persistent and it gave the appearance that the OP was frustrated and shouting at people. Whether or not that was the truth behind it, we cannot be sure. We can only go by what the usual internet user would regard as shouting in text and that the OP clearly understood what caps are, and made a joke of it. Custom flag "hey this person keeps using CAPS, can you have a look?". As for flag preference, if in doubt go for the lower flag. Not sure it's abusive, flag unfriendly. Or raise a custom mod flag. Is it justifiable to downvote a question because of the asker's intent?